I just read my way to a tonload of info on Adam Ant, that can be found on the Net. I haven’t heard an interesting sound from Adam since the late eighties, but I still hope for a miracle. He has been on stage in 2007, without the original Ant members, doing an acoustic set of his old repertoire. I haven’t heard it yet, but it would very much surprise me if that was the miracle. I hope for new songs, true inspiration, a shift of some kind. The longer the wait for miracle, the more the old magic seems to fade away. I already expressed my doubts in an earlier story. Reading about all the stupid fights about money and copyrights doesn’t do my opinion much good either. Is that what music is about for him? I was a fan of this guy! If I ever get in such a position, I hope that I have the sense and the courage to let others have the money and the copyrights of all the old material, and to focus on new stuff. The band Client did a cover of Zerox machine . The cover adds little to nothing to the original. In fact sounds like a imitation of the original. 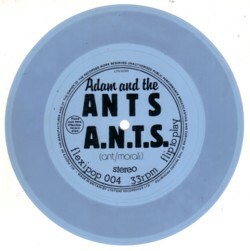 Because I want to end this story with a positive note, here is Adam and the Ants with one of their songs that I like best, A.N.T.S. . It is from pretty rare flexi record, that came with the music magazine Flexipop in 1985. It is a rare proof of Adam Ants sense of humour, a cover of the hit YMCA . I never liked that original song, but I do like the version of Adam & The Ants. Rumour has it that a new Ant cd will be released – or at least recorded – in 2008. What copyrights problems are you referring to, by the way? in case you don’t know a new Adam Ant album is out in early 2012. The signs are good ! !